Our suppliers constantly introduce new designs and close out old ones. It doesn't mean that the old designs are "out-of-date", it just means that they weren't selling well enough. When that happens, they reduce our cost, and we pass the savings on to you by putting those super deals on our Clearance Sale page. We are constantly amazed at some of the beautiful items that get discontinued, but that creates a great opportunity for you! Just the other day a customer called us inquiring about a pair of rectangular hoop earrings from our extensive hoop earring collection--it turns out that the very pair she was interested in was put on clearance that very day, and she saved about 30% over our regular, already-discounted price! 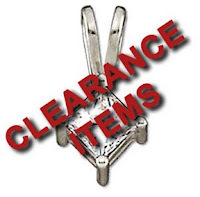 There is a catch, though--all clearance items are subject to prior sale (meaning they can sell out before we have a chance to remove them from the clearance page), and all clearance items are non-returnable.